Got (Great) Milk? We do! I received a great email the other day from Nicholas Yon of Turner Dairy informing us that for the third time in four years Turner’s Dairy has won a very prestigious national award – 1st place at the World Dairy Expo in Madison Wisconsin! We have been customers of Turner Dairy since the day Tazza D’Oro opened 8 1/2 years ago. We respect their commitment to “Higher Standard”, their partnership with 50 local dairy farms who supply the raw milk, their commitment to sustainable agriculture and the fact that their partner farms do not use artificial growth hormones on their cows. 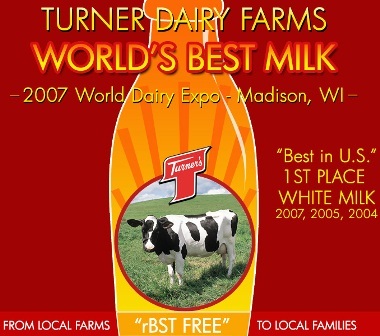 Congrats to Turner Dairy Farms. And thank you for providing a high quality product that helps make our espresso drinks so yummy.